I have Modecom Freetab 8025 tablet with Windows, and want to reinstall the OS. I connected a USB stick using a USB - micro USB cable. When starting the tablet, I can press the ESC key on the external keyboard, which gives me a menu (see #1, below). In the boot manager, I have two choices (see #2, below). The second option looks like #3, below. The 6th option SCU in the ESC menu looks like #4, below. How do I boot from USB? With Rufus, I tried all 3 options in the partition scheme and target system type. In the EFI shell (image 3), you can use commands to locate the boot loader on the external USB drive, but it's going to take some poking around. Type ls to view the files on the disk. An ESP normally has a directory called EFI, and there may be one or more other files or directories. The internal disk probably has an EFI\Microsoft directory and an EFI\BOOT directory. The external disk should have an EFI\BOOT directory, and might or might not have an EFI\Microsoft directory. The external disk might have files or directories associated with the installer; it depends on how Rufus set it up. Type cd to change into a directory, as in cd EFI\BOOT to change into EFI\BOOT on the current filesystem. You may want to familiarize yourself with what's on the USB disk in a fully-functioning computer so that you can more easily identify it in the EFI shell. One more point: I just checked the specs, and your tablet has an Intel Atom CPU. I don't see anything explicit about this on the manufacturer's site, but most Atom-based tablets have 32-bit UEFIs. This means you can install only a 32-bit version of Windows. If you try to install a 64-bit version of Windows, it won't work; it won't even have the right boot loader file -- for a 64-bit UEFI, it's bootx64.efi, rather than bootia32.efi. OTOH, I'm only assuming that the tablet has a 32-bit UEFI; if I'm wrong, you'd need a 64-bit Windows, and you'd launch its boot loader using the bootx64.efi binary. Not the answer you're looking for? Browse other questions tagged boot usb-flash-drive uefi rufus or ask your own question. How can I boot from a Windows 10 USB stick on a Medion Akoya? 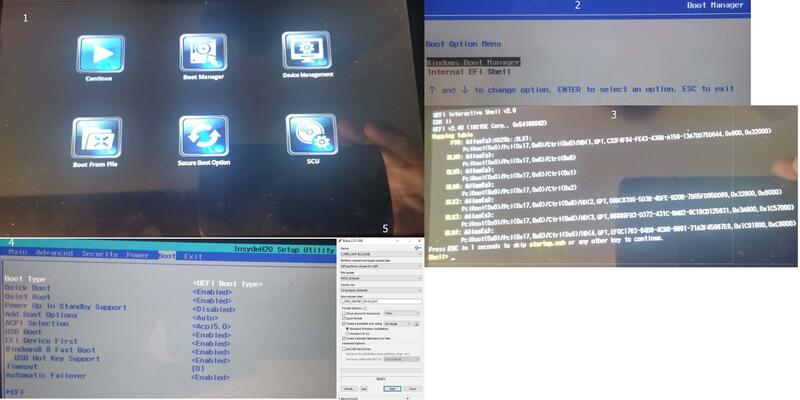 how to boot from USB on i-life zedbook tablet?